Great Polisher, plus lifetime warranty! just buy it already! I've done some research, best bang for the your buck. Very easy to use and great results!! This will not disappoint you. Go for the 25 ft. cord option and the 2" conversion disc for smaller pad use. works great at restoring headlight lens! Thanks Griot's garage! Overall I tested a area on my 33 year old 1985 SVO Mustang, it corrected some mistakes I made years earlier with a circular polisher. I had to wait several months before using this because of the unusually severe winter and spring. My 14-year-old car, superficially fine, needed a lot of work to rid swirls. I was a bit concerned about my first encounter with an orbital polisher, but Griot's machine worked fine with the compound I chose. To any first-time users: study the autogeek videos carefully. They are enormously helpful. The tool works fine except it is a little heavy for a 79 year old. I also bought the 3 inch tool which I will use on the side panels. Have had a little more than a year. Have done 4 cars with it. Stopped running today,had to replace the brushes, two extra provided with the unit when new. Still not working,customer service said brushes are problematic, I will be sending the unit back,hoping they can repair it. When it works it does a good job, but worn brushes after detailing 4 cars. I am not impressed if that is as long as brushes will last. ProsGood job when it works. 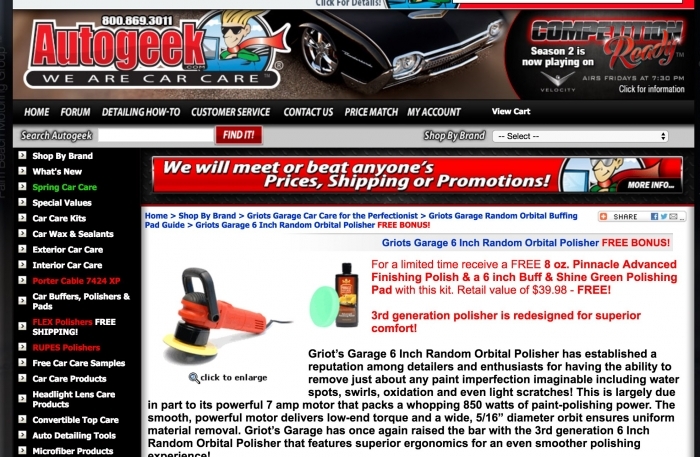 Great product - don't fall for "FREE BONUS"
The Griots Garage RO Polisher is awesome, just tried it on my car for the first time. Kit came with quality products for pads and cleaners. No issues with product. However, do not fall for the FREE BONUS listed at the top of the page for the Polisher, where Autogeek is stating there is a FREE Pinnacle Polish and green pad. That is only with a few kits and only when shown inside the kit selection itself. I find this rather misleading, they should only list it within the kits if that is the case. I called customer support and they did not help, and stated they did not find this misleading. ProsSelectable speeds, adjustable handle, quality product. Kit with pads, cloths and cleansers is high quality as well. Works very well. ConsA little heavy, but maybe they are all that way. No issues on product, only dissatisfaction with the Autogeek buying experience and customer service. Marketing and Customer Satisfaction: consider changing your web placement of free bonuses. Great bang for the buck. Love the power and it fits the bill for what I need. Griots 6" ROP Works GREAT! I've used the PC and HF 6" ROPs and really wanted a large throw polisher however, the BOSS, Rupes, and Flex were really going to meet my needs. I begrudgingly went with another 8mm polisher and I am really impressed. The Griots polisher has plenty of power and is built really well. The rotation continues even though I applied quite a bit of pressure, the rotation continues around tight corners, and the motion is smooth. With all of that power, the polisher is quieter and smoother than my previous 2 machines. I recently purchased this polisher for my son, who just bought his first car, a beautiful 1994 Acura Legend. The paint finish is nice, and he wants to keep it that way. My first polisher was the first generation of the Griot's 6 inch random orbital, and I hope that he likes his as well as I liked mine. I still have it, and when I did a side by side comparison I was tempted to keep the one I bought for him and give him mine. (Just kidding) They are similar in size and overall appearance, but you can tell that Griot's have made improvements that detailers can appreciate. You can't go wrong with this workhorse of a polisher, it's a industry standard that despite it's low cost delivers a quality finish that one can be proud of. I would not have bought it for him if it wasn't the best entry level polisher you can get that is both good and safe to use. ProsErases swirls, water spots, light scratches, and oxidation. Takes you from point A to point B in a reasonably short period of time that makes one feel as if the time and effort expended is bearing tangible results. Conssome have complained about vibration when buffing, but to me it's negligible considering the cost of the polisher and the end result, which makes it worthwhile. Bought one that came with an orange pad and all in one sealer. Washed, call bared, and sealed it, did a great job removing all swirls and a few scuffs and a little big of pain transfer. Paint looks better than when it was brand new. Prosall good.my boss has been using your products for along time and turned me on to you guys. Conscould put a beer holder on it just kidding. Bought this buffer about 6 months ago, and it's been the best investment I've made for my cars (and all of my friends' cars LOL) in a long time. Works exactly like it should, feels extremely sturdy, doesn't shake and vibrate uncontrollably, and stop spinning when you have to put some extra pressure on it (unlike the PC), and has made quick, GORGEOUS work of every car I've detailed thus far. Pros25' cable, plenty of power, solid feel, adjustable/removable handle.... Way more than I expected for the price, and it really gets the job done. ConsCons: Other than the position of the power selector wheel I haven't found any. Has much more power than my old Porter Cable 7336. Did notice an issue though. I have the version with the 25 foot cable. Worked fine plugged into an outlet but when I used a 50 ft 14 gauge extension cord with it, it wouldn't turn on. For some reason it must not have been getting enough juice. Never had a problem with that cable. I bought it on discount from Auto Geek. Great value for the price. Great polisher for the money. Item arrived fast and well packaged. I've used it on two cars and it works as expected. Much better than my old buffer. This seems like the right choice for someone like me who just wants to keep their personal vehicles looking good. ProsPowerful and will hold up when you need to apply extra pressure to a problem area. I've taken the cheap way out 3 times in the past several years by getting inexpensive orbital buffers. After breaking the third one, I bit the bullet and bought the Griot Garage orbital buffer. Wow--what a difference that makes. ...sometimes I'm a slow learner! ConsThe way I hold the polisher, I tend to bump the variable speed dial and inadvertently adjust it a bit more often than I'd like. I'd like to see the ability to lock it in for those of us with that problem and don't need to adjust the speed frequently. I'm sure I'll get used to it. Great DA machine better than the PC. So far polished out a jet black 2013 Camaro to remove holograms. Also great with using the NanoSkin Auto Scrubbers for removing heavy overspray from vehicles. Good to have in any professionals arsenal. I agree with Dave. This is a great polisher. I saw no need to spend all that money for a Flex. Flex is a great polisher but for me (and my Porsche) the Griot's is perfect. I am by no means a professional detailer. I am the weekend therapy patient. I got the HD version for $154. For the price this is a great polisher. Spending almost 4 beans for a Flex (for me at least) didn't make sense. I could see a pro using this but I am sure the flex is far better but for me this does the job and does it very well.